Cecile's latest batch of students watched attentively as she launched into the last step of the dish—swirling grasshoppers around in a frying pan before setting them on the coucous. In their bid to find an environmentally-friendly alternative to meat, Richard, 41, Mariet, 53, and Seppo, 43, are looking to insects. And they are counting on Cecile to show them how to cook a menu of couscous, hamburger and baklava pastries with mealworms, grasshoppers or other insect larvae as key ingredients. "The point is to find an alternative to meat. Not necessarily to replace it, but to reduce it," said Mariet, who has paid 50 euros ($68)for tonight's course. "It's easier if someone teaches you," she said, at Cecile's kitchen in southeastern Netherlands' Sittard. A smiling Richard confesses that, for him, insects offer a perfect middle-path between being a carnivore and a herbivore. 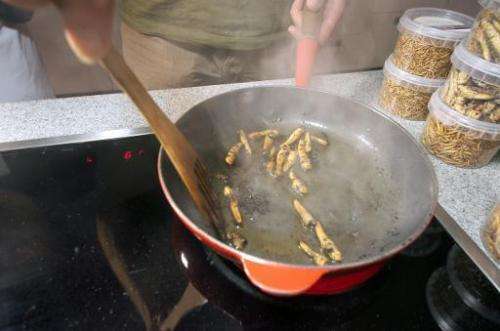 "I want to live in a healthy way, but being vegetarian is a bit too hard for me," said Richard, who acquired a taste for creepy crawlies while travelling in southeast Asia. With the meat industry stricken with problems, from horsemeat labelled as beef to the environmental impact of growing animal feed, protein-rich and fat-poor insects are increasingly seen as a viable alternative. Ten times more feed is required to grow the comparable weight in cows than in insects, according to the Netherlands' Wageningen University, which has a special insect department and was a pioneer at promoting their consumption. Insect eating has not yet won mainstream acceptance in Europe, although around two billion people elsewhere in the world consume them regularly. Most Europeans remain reluctant to bite into a grasshopper, grub or other insect even if they are dry, clean and disease free. 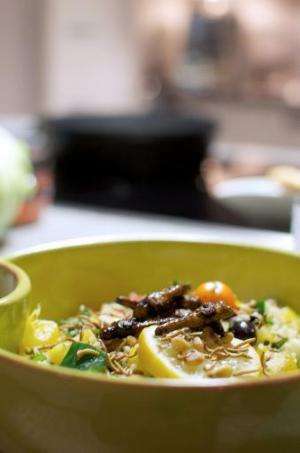 "Seriously, I don't understand why people are so disgusted by insects," said Seppo, sprinkling a handful of grasshoppers over his steaming couscous dish. "Frankly, I know what I'd prefer if I had to choose between an insect or seafood such as an oyster or mussel," he said. 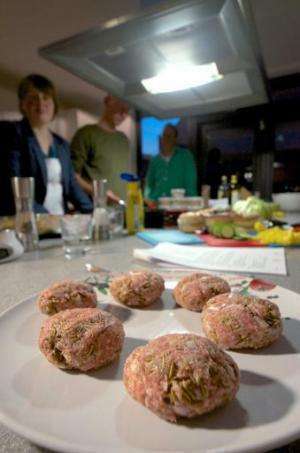 Meanwhile Mariet is mixing mealworms with minced beef to make burgers, renamed here "hambuggers", a potentially problematic name in English-speaking countries, while Richard browns some grasshoppers marinated in soya sauce in the frying pan. The freeze-dried insects can be stored for up to a year, said Arno Snellens, who founded the Insectable wholesale bug business, which helps organises these pedagogical evenings with Cecile Lormans. "It's inevitable, insects are the future, we can't go on producing meat on such a scale," said Snellens, who claims his company's turnover doubles every six months. "It takes time for mentalities to change." Insect sales are still paltry in the Netherlands compared to meat, but Marcel Dicke, entomologist at Wageningen University, insists that change is afoot. Insects are slowly acquiring a culinary niche, from cooking books to increased supply and demand, he says. "Fifteen years ago, people said 'what, insects, really?' but today people say 'oh yes, where can I get some?" said Dicke. "Of course it takes time for mentalities to chance, but they can change, and I think the fact that people want to learn to cook is representative of this trend." The Meertens insect production business, also in the southeastern Netherlands, sells just 2-3 percent of its production for human consumption, the rest is for animal feed. Nevertheless, the amount of production for humans has been steadily rising since production began in 2008. The major problem is cost: the market, and therefore production, is still far too small to make it as profitable as selling meat. Arno sells 30 grammes (around an ounce) of freeze-dried grasshoppers for 12.50 euros (around $17), while 50 grammes of mealworms costs 8.50 euros. "There are several ways to convince people, it depends on the individual: some prefer not to see they're eating insects, for them to be powdered in a quiche for instance, while others prefer to insect still to be whole when eaten," said Dicke. Meanwhile, three newly qualified insect chefs are licking their lips as they sampled what they have just prepared. "It tastes slightly nutty, like hazelnuts," said Seppo, biting into his burger. "It's like nothing I've ever tasted, but it's tasty, and crunchy," said Richard. "You shouldn't try to compare it to anything else, I'd just say it tastes of insects."